Every third Saturday in October for the past 23 years, come rain, shine, or scattered to broken cloud cover, Bisbee’s steep stairs have been packed with people from around the country testing their athletic prowess as they wend their way up several flights of concrete steps. 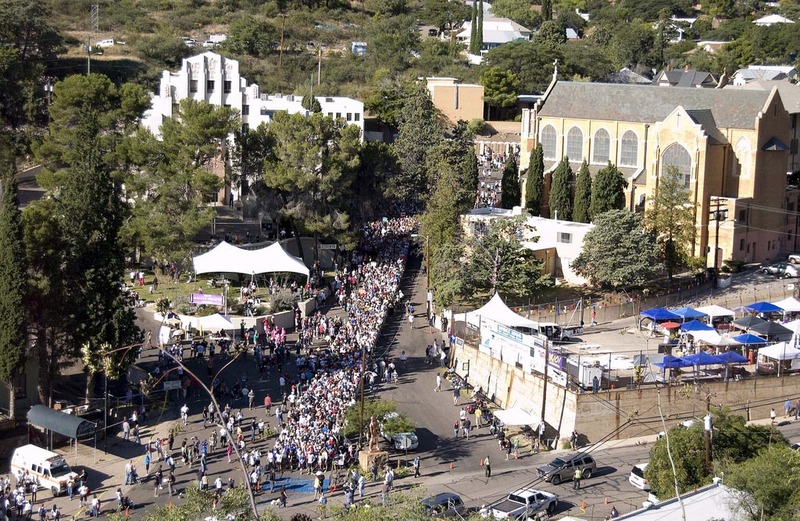 This fall on Saturday, October 18, the Great Bisbee Stairclimb, will mark its 24th anniversary. Note: During the weeks preceeding this year's stair climb, Bisbee has received an unusual amount of rain. This will not delay the Great Bisbee Stairclimb but participants will need to take extra caution both on the stairs and the streets. Stair climbing has become a popular sport not just for the young but for thousands of “older” men and women. 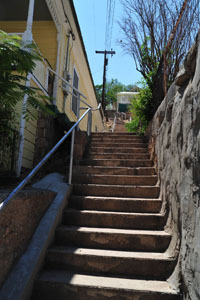 Bisbee’s climb is a real indication of this attraction: participants in the 2010 event ranged from a young of 5 years of age to Totten Warfield who was 86. The event is nationally recognized; the Wall Street Journal selected the Bisbee 1000 the Great Stairclimb Fundraiser as one of the top five 5K stair climbs in the US last year and for 2011, Top Events USA placed it in Arizona’s best 10 events. Net proceeds from the Great Bisbee Stair Climb are donated to local communities for health-related programs according to Cynthia Conroy, founder of the Bisbee 1000 and president of the board of Save Our Stairs, Inc. Conroy says that in the past year a total of $120,501 has been provided to local schools, the Bisbee Boys and Girls Club, Bisbee Health and Wellness, the Renaissance House women’s shelter and the Bisbee Senior Center, to include just a few of the many recipients of funding. OK, what is the the Great Bisbee Stairclimb? 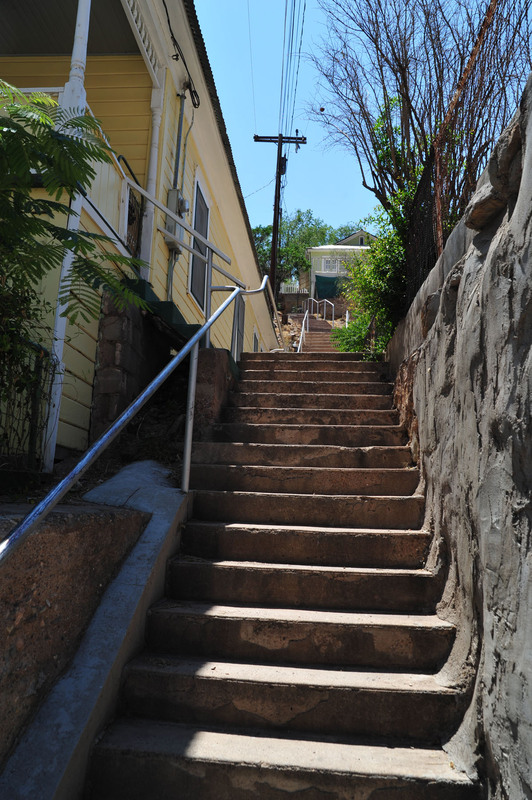 It’s the challenge of climbing a figure-eight course up nine sets of stairs, down roadways and through historic old Bisbee. There are categories for entrants who choose to run the stairways, those who will walk and others who have decided on a more leisurely pace and will stroll. Entry categories are further divided into male and female divisions with numerous age groupings for runners, walkers and strollers. As you can see in the image to the lower right, some of the folks choose colorful outfits for their day on the stairs. Others, as below, take the morning somehwat more seriously. Center right is one of the staircases just waiting for this year's event. Our rustic little town is likely to be crowded during the stair climb weekend (many of the bed & breakfasts, hotels & motels and unique lodging facilities have already been booked). There were 1960 entrants for the 2010 event; a significant increase from 2009's total of 1669. Interestingly, more than 1000 women participated in the 2009 event compared to 660 males. Click here for the 2014 Great Bisbee Stairclimb schedule...and if you’re out there on the stairs, good luck. Copyright © 2011-2014 bisbeeaz85603.com. All Rights Reserved.